The expanded range of SoCs will each include X9 LTE modems and built-in support for dual cameras. The 653 and 626 will ship before the end of this year with the 427 scheduled for 2017. Not long after MediaTek made public the Helio P15, Qualcomm announced a new range of entry-level SoCs in the Snapdragon family with the 653, 626, and 425. The three versatile solutions can be easily adapted for a wide range of smartphones and will all include support for dual cameras, Quick Charge 3.0, and TruSignal antenna boost. The Qualcomm X9 model will also be integrated onto all three SoCs for Cat.7 download (300 Mbps) and Cat.13 upload (150 Mbps) speeds. 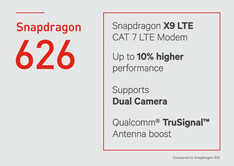 The successor to the Snapdragon 652 utilizes four Cortex-A72 cores and four Cortex-A53 cores for a total of eight. The high 1.95 GHz clock rate processor is paired with an Adreno 510 GPU for a promised 10 percent performance gain over the outgoing Snapdragon 652. New features include support for up to 8 GB RAM, display resolutions of up to 2560 x 1600 pixels, dual cameras of up to 21 MP, and EVS (Enhanced Voice Services) for VoLTE calls. The SoC will continue to use the 28 nm fabrication process and will unfortunately not carry the faster Cortex-A73 core. 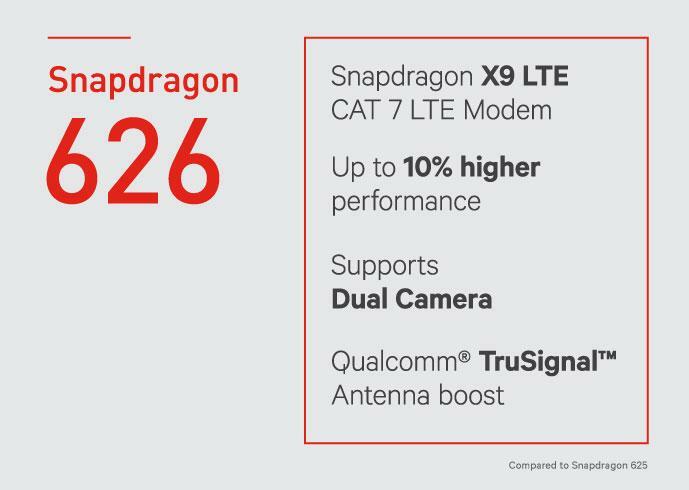 The Snapdragon 626 promises up to 10 percent faster speeds with its eight Cortex-A53 cores and will likely compete directly against the Helio P15. Like the MediaTek equivalent, the Qualcomm SoC will run at up to 2.2 GHz with its integrated Adreno 506 GPU. 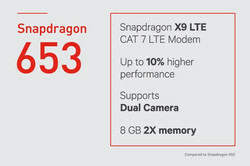 Other features include support for dual cameras of up to 24 MP and display resolutions of up to 1920 x 1200 pixels. 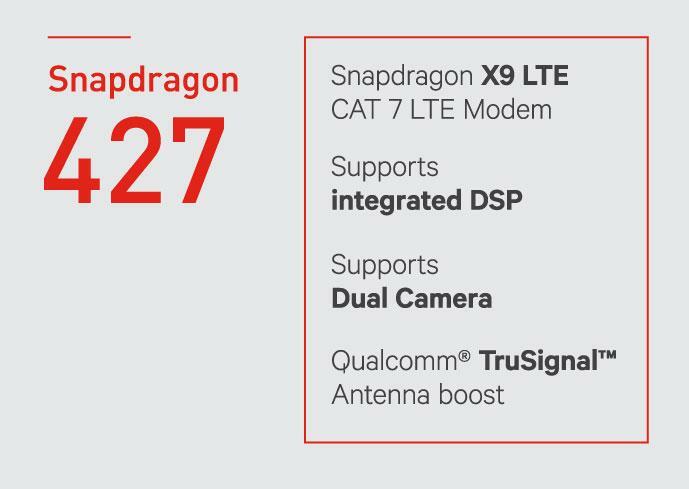 The Snapdragon 626 will purportedly be manufactured in 14 nm compared to the 28 nm MediaTek P15 for better energy efficiency. 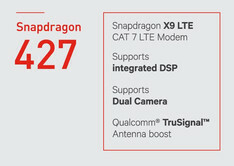 The lower-end Snapdragon 427 will replace the Snapdragon 425 when it launches next year. The quad-core SoC utilizes four Cortex-A53 modules at up 1.4 GHz with an integrated Adreno 308 GPU. Other features include support for cameras of up to 16 MP, TruSignal technology, and display resolutions of up to 1280 x 800 pixels. Dual cameras are also supported, though it remains to be seen if budget smartphones will incorporate such a feature. 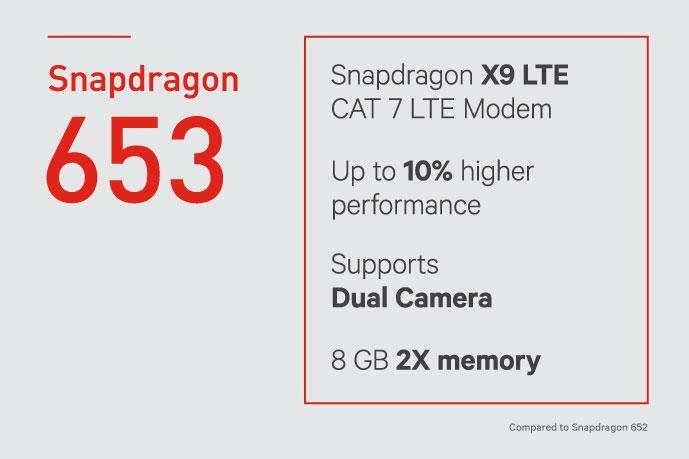 Interestingly, both the Snapdragon 626 and 653 will be shipping ahead of the 427.